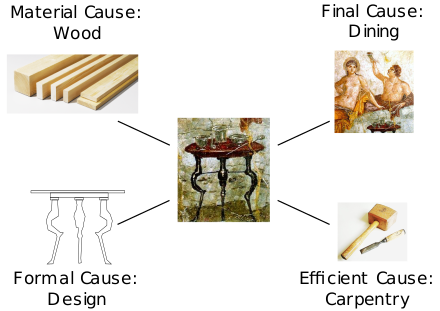 Aristotle's Four Causes illustrated for a table: material (wood), formal (design), efficient (carpentry), final (dining). The "four causes" are elements of an influential principle in Aristotelian thought whereby explanations of change or movement are classified into four fundamental types of answer to the question "why?". Aristotle wrote that "we do not have knowledge of a thing until we have grasped its why, that is to say, its cause." While there are cases where identifying a "cause" is difficult, or in which "causes" might merge, Aristotle held that his four "causes" provided an analytical scheme of general applicability. Aitia, from Greek αἰτία, was the word that Aristotle used to refer to the causal explanation that has traditionally been translated as "cause", but this specialized, technical, philosophical usage of the word "cause" does not correspond exactly to its most usual applications in everyday English language. The translation of Aristotle's αἰτία that is nearest to current ordinary language could be "question" or "causal explanation", although any such terms may mask the fact that Aristotelians consider the four causes to be more fundamental in nature than mere explanations. In this article, the peculiar philosophical usage of the word "cause" will be employed, for tradition's sake, but the reader should not be misled by confusing this technical usage with current ordinary language. Matter: a change or movement's material cause, is the aspect of the change or movement which is determined by the material that composes the moving or changing things. For a table, that might be wood; for a statue, that might be bronze or marble. Form: a change or movement's formal cause, is a change or movement caused by the arrangement, shape or appearance of the thing changing or moving. Aristotle says for example that the ratio 2:1, and number in general, is the cause of the octave. Agent: a change or movement's efficient or moving cause, consists of things apart from the thing being changed or moved, which interact so as to be an agency of the change or movement. For example, the efficient cause of a table is a carpenter, or a person working as one, and according to Aristotle the efficient cause of a boy is a father. End or purpose: a change or movement's final cause, is that for the sake of which a thing is what it is. For a seed, it might be an adult plant. For a sailboat, it might be sailing. For a ball at the top of a ramp, it might be coming to rest at the bottom. The four "causes" are not mutually exclusive. For Aristotle, several answers to the question "why" have to be given to explain a phenomenon and especially the actual configuration of an object. For example, if asking why a table is such and such, a complete explanation, taking into account the four causes, would sound like this: This table is solid and brown because it is made of wood (matter), it does not collapse because it has four legs of equal length (form), it is as such because a carpenter made it starting from a tree (agent), it has these dimensions because it is to be used by men and women (end). In his philosophical writings, Aristotle used the Greek word αἴτιον, aition, a neuter singular form of an adjective. The Greek word had meant, perhaps originally in a "legal" context, what or who is "responsible", mostly but not always in a bad sense of "guilt" or "blame"; alternatively it could mean "to the credit of" someone or something. The appropriation of this word by Aristotle and other philosophers reflects how the Greek experience of legal practice influenced the concern in Greek thought to determine what is responsible. The word developed other meanings, including its use in philosophy in a more abstract sense. About a century before Aristotle, the anonymous author of the Hippocratic text On Ancient Medicine had described the essential characteristics of a cause: "We must, therefore, consider the causes of each [medical] condition to be those things which are such that, when they are present, the condition necessarily occurs, but when they change to another combination, it ceases." In the present context, Aristotle used the four causes to provide different answers to the question, "because of what?" The four answers to this question illuminate different aspects of how a thing comes into being or of how an event takes place. Whereas modern physics looks to simple bodies, Aristotle's physics instead treated living things as exemplary. However, he felt that simple natural bodies such as earth, fire, air, and water also showed signs of having their own innate sources of motion, change, and rest. Fire, for example, carries things upwards, unless stopped from doing so. Things like beds and cloaks, formed by human artifice, have no innate tendency to become beds or cloaks. In Aristotelian terminology, material is not the same as substance. Matter has parallels with substance in so far as primary matter serves as the substratum for simple bodies which are not substance: sand and rock (mostly earth), rivers and seas (mostly water), atmosphere and wind (mostly air and then mostly fire below the moon). Only individuals are said to be substance (subjects) in the primary sense. Secondary substance, in a different sense, also applies to man-made artifacts. Aristotle considers the formal "cause" (eidos) as describing the pattern or form which when present makes matter into a particular type of thing, which we recognize as being of that particular type. By Aristotle's own account, this is a difficult and controversial concept. It links with theories of forms such as those of Aristotle's teacher, Plato, but in Aristotle's own account (see his Metaphysics), he takes into account many previous writers who had expressed opinions about forms and ideas, but he shows how his own views differ from them. Aristotle defines the agent or efficient "cause" (kinoun) of an object as that which causes change and motion to start or stop (such as a painter painting a house) (see Aristotle, Physics II 3, 194b29). In many cases, this is simply the thing that brings something about. For example, in the case of a statue, it is the person chiseling away which transforms a block of marble into a statue. Only this one of the four causes is like what an ordinary English-speaker would regard as a cause. This is most obvious in the animals other than man: they make things neither by art nor after inquiry or deliberation. That is why people wonder whether it is by intelligence or by some other faculty that these creatures work, – spiders, ants, and the like... It is absurd to suppose that purpose is not present because we do not observe the agent deliberating. Art does not deliberate. If the ship-building art were in the wood, it would produce the same results by nature. If, therefore, purpose is present in art, it is present also in nature. For example, according to Aristotle, a seed has the eventual adult plant as its end (i.e., as its telos) if and only if the seed would become the adult plant under normal circumstances. In Physics II.9, Aristotle hazards a few arguments that a determination of the end (cause) of a phenomenon is more important than the others. He argues that the end is that which brings it about, so for example "if one defines the operation of sawing as being a certain kind of dividing, then this cannot come about unless the saw has teeth of a certain kind; and these cannot be unless it is of iron." According to Aristotle, once a final "cause" is in place, the material, efficient and formal "causes" follow by necessity. However, he recommends that the student of nature determine the other "causes" as well, and notes that not all phenomena have an end, e.g., chance events. Aristotle saw that his biological investigations provided insights into the causes of things, especially into the final cause. We should approach the investigation of every kind of animal without being ashamed, since in each one of them there is something natural and something beautiful. The absence of chance and the serving of ends are found in the works of nature especially. And the end, for the sake of which a thing has been constructed or has come to be, belongs to what is beautiful. —  Aristotle, On the Parts of Animals 645a 21-26, Book I, Part 5. Here, in seeing that Final Cause – causation at the call of self-posited aim or end – is the only full and genuine cause, we further see that Nature, the cosmic aggregate of phenomena and the cosmic bond of their law which in the mood of vague and inaccurate abstraction we call Force, is after all only an effect... Thus teleology, or the Reign of Final Cause, the reign of ideality, is not only an element in the notion of Evolution, but is the very vital cord in the notion. The conception of evolution is founded at last and essentially in the conception of Progress: but this conception has no meaning at all except in the light of a goal; there can be no goal unless there is a Beyond for everything actual; and there is no such Beyond except through a spontaneous ideal. The presupposition of Nature, as a system undergoing evolution, is therefore the causal activity of our Pure Ideals. These are our three organic and organizing conceptions called the True, the Beautiful, and the Good. However, Edward Feser argues, in line with the Aristotelian and Thomistic tradition, that finality has been greatly misunderstood. Indeed, without finality, efficient causality becomes inexplicable. Finality thus understood is not purpose but that end towards which a thing is ordered. When a match is rubbed against the side of a matchbox, the effect is not the appearance of an elephant or the sounding of a drum, but fire. The effect is not arbitrary because the match is ordered towards the end of fire which is realized through efficient causes. Our language is teleological. We believe that autonomous agents constitute the minimal physical system to which teleological language rightly applies. Francis Bacon wrote in his Advancement of Learning (1605) that natural science "doth make inquiry, and take consideration of the same natures : but how? Only as to the material and efficient causes of them, and not as to the forms." According to the demands of Bacon, apart from the "laws of nature" themselves, the causes relevant to natural science are only efficient causes and material causes in terms of Aristotle's classification, or to use the formulation which became famous later, all nature visible to human science is matter and motion. Using the terminology of Aristotle, he divided knowledge into physics and metaphysics in The New Organon. Bacon's position became the standard one for modern science. Explanations in terms of final causes remain common in evolutionary biology. Francisco J. Ayala has claimed that teleology is indispensable to biology since the concept of adaptation is inherently teleological. In an appreciation of Charles Darwin published in Nature in 1874, Asa Gray noted "Darwin's great service to Natural Science" lies in bringing back Teleology "so that, instead of Morphology versus Teleology, we shall have Morphology wedded to Teleology". Darwin quickly responded, "What you say about Teleology pleases me especially and I do not think anyone else has ever noticed the point." Francis Darwin and T. H. Huxley reiterate this sentiment. The latter wrote that "..the most remarkable service to the philosophy of Biology rendered by Mr. Darwin is the reconciliation of Teleology and Morphology, and the explanation of the facts of both, which his view offers." James G. Lennox states that Darwin uses the term 'Final Cause' consistently in his Species Notebook, Origin of Species and after. Contrary to the position described by Francisco J. Ayala, Ernst Mayr states that "adaptedness... is a posteriori result rather than an a priori goal-seeking." Various commentators view the teleological phrases used in modern evolutionary biology as a type of shorthand. For example, S. H. P. Madrell writes that "the proper but cumbersome way of describing change by evolutionary adaptation [may be] substituted by shorter overtly teleological statements" for the sake of saving space, but that this "should not be taken to imply that evolution proceeds by anything other than from mutations arising by chance, with those that impart an advantage being retained by natural selection." However, Lennox states that in evolution as conceived by Darwin, it is true both that evolution is the result of mutations arising by chance and that evolution is teleological in nature. Statements that a species does something "in order to" achieve survival are teleological. The validity or invalidity of such statements depends on the species and the intention of the writer as to the meaning of the phrase "in order to". Sometimes it is possible or useful to rewrite such sentences so as to avoid teleology. Some biology courses have incorporated exercises requiring students to rephrase such sentences so that they do not read teleologically. Nevertheless, biologists still frequently write in a way which can be read as implying teleology even if that is not the intention. causa efficiens is the effect that brings about the finished result. Whoever builds a house or a ship or forges a sacrificial chalice reveals what is to be brought forth, according to the terms of the four modes of occasioning. The educationist David Waddington comments that although the efficient cause, which he identifies as "the craftsman", might be thought the most significant of the four, in his view each of Heidegger's four causes is "equally co-responsible" for producing a craft item, in Heidegger's terms "bringing forth" the thing into existence. Waddington cites Lovitt's description of this bringing forth as "a unified process". Tinbergen's four questions, named after the ethologist Nikolaas Tinbergen and based on Aristotle's four causes, are complementary categories of explanations for animal behaviour. They are also commonly referred to as levels of analysis. The four questions are on function, what an adaptation does that is selected for in evolution; phylogeny, the evolutionary history of an organism, revealing its relationships to other species; mechanism, namely the proximate cause of a behaviour, such as the role of testosterone in aggression; and ontogeny, the development of an organism from egg to embryo to adult. ^ Aristotle, Physics 194 b17–20; see also: Posterior Analytics 71 b9–11; 94 a20. ^ a b c "[F]or a full range of cases, an explanation which fails to invoke all four causes is no explanation at all. "—"Four Causes". Falcon, Andrea. Aristotle on Causality. Stanford Encyclopedia of Philosophy 2008. ^ a b Leroi 2015, pp. 91–92. ^ a b Hankinson, R. J. (1998), Cause and Explanation in Ancient Greek Thought (e-book)|format= requires |url= (help), [Oxford]: OUP Premium, p. 159, doi:10.1093/0199246564.001.0001, ISBN 9780198237457, Aristotle famously distinguishes four 'causes' (or causal factors in explanation), the matter, the form, the end, and the agent. ^ Aristotle, "Book 5, section 1013a", Metaphysics, Translated by Hugh Tredennick Aristotle in 23 Volumes, Vols. 17, 18, Cambridge, MA, Harvard University Press; London, William Heinemann Ltd. 1933, 1989; (hosted at perseus.tufts.edu.) Aristotle also discusses the four "causes" in his Physics, Book B, chapter 3. ^ According to Reece (2018): "Aristotle thinks that human action is a species of animal self-movement, and animal self-movement is a species of natural change. Natural changes, although they are not substances and do not have causes in precisely the same way that substances do, are to be explained in terms of the four causes, or as many of them as a given natural change has: The material cause is that out of which something comes to be, or what undergoes change from one state to another; the formal cause, what differentiates something from other things, and serves as a paradigm for its coming to be that thing; the efficient cause, the starting-point of change; the final cause, that for the sake of which something comes about." ^ a b c d Preus, Anthony (2015). "Material cause". Historical Dictionary of Ancient Greek Philosophy (2nd ed.). Rowman and Littlefield. ISBN 978-0810854871. ^ Lloyd, G. E. R. (1996), "Causes and correlations", Adversaries and authorities: Investigations into ancient Greek and Chinese science, Cambridge: Cambridge University Press, p. 96, ISBN 0-521-55695-3, It is clear that of these four, only the efficient cause looks like a cause in any ordinary English sense. ^ The Complete Works of Aristotle Vol. I. The Revised Oxford Translation, ed. Jonathan Barnes). ^ Aristotle gives this example in Parts of Animals I.1. ^ Aristotle, Physics II.9. 200b4–7. ^ Physics II.5 where chance is opposed to nature, which he has already said acts for ends. ^ Compare: Feser, Edward (2011) . Aquinas: A Beginner's Guide. Beginner's Guides (Reprint ed.). Oxford: Oneworld Publications. ISBN 9781780740065. Retrieved 2018-03-12. [...] three principles are central to Aquinas's general metaphysics [...] the principle of finality is in a sense the most fundamental of them, given that the final cause is 'the cause of causes': for, again in Aquinas's' view an efficient cause can bring an effect in to being only if it is 'directed towards' that effect; and it is ultimately in that sense that the effect is 'contained in' the efficient cause. ^ Compare: Feser, Edward (2011) . Aquinas: A Beginner's Guide. Beginner's Guides (Reprint ed.). Oxford: Oneworld Publications. ISBN 9781780740065. Retrieved 2018-03-12. A match, for example, reliably generates flame and heat when struck, and never (say) frost and cold, or the smell of lilacs, or thunder. ^ Kauffman, S., Logan, R. K., Este, R., Goebel, R., Hobill, D., & Shmulevich, I. (2008). Propagating organization: An enquiry. Biology & Philosophy, 23(1), 27-45. ^ a b Ayala, Francisco (1998). "Teleological explanations in evolutionary biology." Nature's purposes: Analyses of Function and Design in Biology. The MIT Press. ^ Mayr, Ernst W. (1992). "The idea of teleology" Journal of the History of Ideas, 53, 117–135. ^ Madrell SHP (1998) "Why are there no insects in the open sea?" The Journal of Experimental Biology 201:2461–2464. ^ Reiss, John O. (2009). Not by Design: Retiring Darwin's Watchmaker. University of California Press. ^ Heidegger 1977, pp. 289-290. ^ Heidegger 1977, p. 295. ^ Waddington, David (2005). "A Field Guide to Heidegger Understanding | The Question Concerning Technology". Educational Philosophy and Theory. 37 (4): 568. ^ Lovitt, W. (1972). "A Gesprach with Heidegger on Technology, Man and World". 6 (1): 44–62. Cohen, Marc S. "The Four Causes" (Lecture Notes) Accessed March 14, 2006. Falcon, Andrea. Aristotle on Causality (link to section labeled "Four Causes"). Stanford Encyclopedia of Philosophy 2008. Heidegger, Martin (1977). Krell, D. F. (ed.). The Question Concerning Technology. Basic Writings. Harper & Row. Hennig, Boris. "The Four Causes." Journal of Philosophy 106(3), 2009, 137–60. Leroi, Armand Marie (2015). The Lagoon: How Aristotle Invented Science. Bloomsbury. ISBN 978-1408836224. Moravcsik, J.M. "Aitia as generative factor in Aristotle's philosophy." Dialogue, 14 : pp 622–638, 1975. Reece, Bryan C. (2018). "Aristotle's Four Causes of Action". Australasian Journal of Philosophy. doi:10.1080/00048402.2018.1482932. English translation of Study on Phideas, by Pía Figueroa written with theme of Final Cause as per Aristotle. Philosophy in the ancient world: an introduction. By James A. Arieti. p. 201. Doctrine of Being in the Aristotelian Metaphysics. By Joseph Owens and Etienne Gilson. A Compass for the Imagination, by Harold C. Morris. Philosophy thesis elaborates on Aristotle's Theory of the Four Causes. Washington State University, 1981. This page was last edited on 17 February 2019, at 11:55 (UTC).